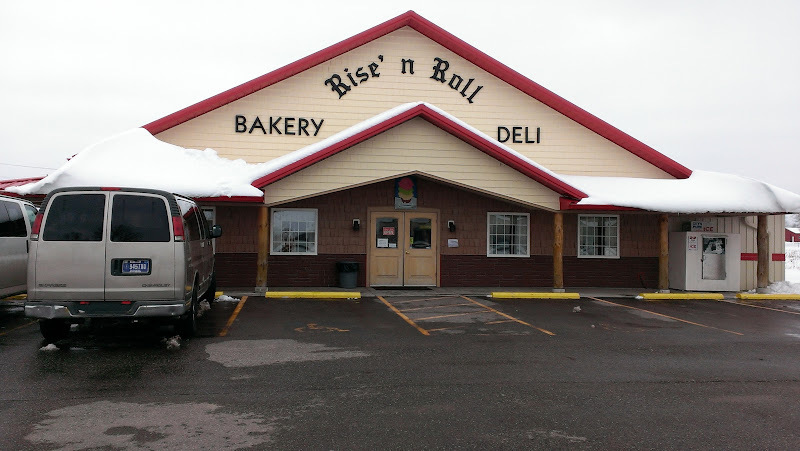 Following the advice of our Entegra tour guide, Dave, who is their National Sales Manager, once we left the plant we headed to the Rise ‘n Roll Bakery. Dave, who professed to not normally like too many sweets (like us), raved about the caramel cinnamon donuts telling us that every time they have a dealer or supplier conference it has become mandatory to supply some of these – or else! After checking them out, I can understand why! 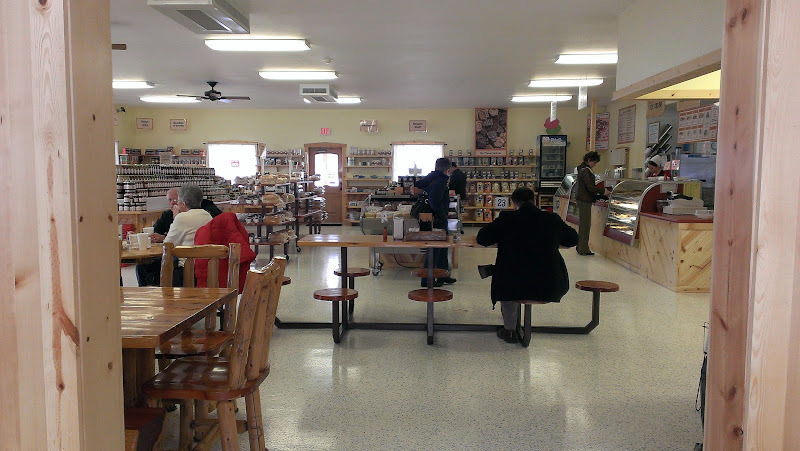 Run by the Amish, this is more than just a bakery. Tables and shelves chock full of home made jams/jellies, salsas, granola, pancake mixes, canned vegetables and fruits, pickles, home made noodles, butter and cheese and bread spreads greet you as you enter the door. 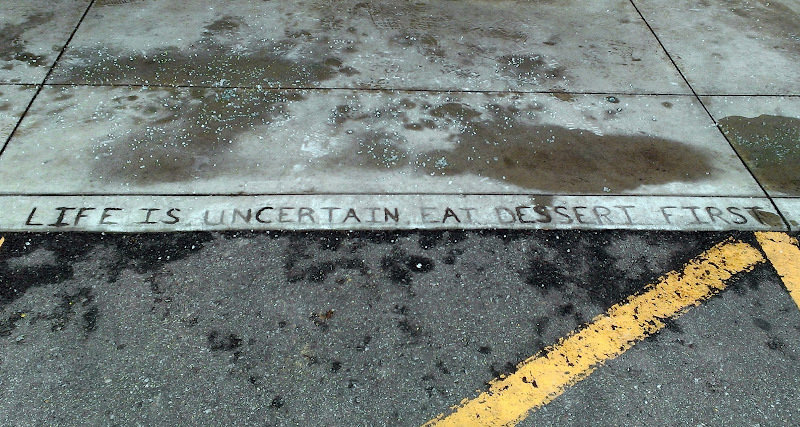 This is after you step over a curbstone at the entrance that reads “Life is uncertain, eat dessert first”. Sounds like a great philosophy to me! We were glad to see that they also served lunch since by now it was after 1:00 p.m. and we were hungry. They had a 1/2 sandwich and soup special and the Amish girl behind the counter told us we could split one of their subs and have that instead of their normal sandwich offering. Tough decision! After several minutes of deliberation, we finally decided to split a Rise and Roll King sandwich which was Chicken, Bacon, and Colby Cheese melted on a Bacon Onion Cheddar Sub roll with Ranch dressing and the usual sub veggies and two cups of ham chowder. The day we went they offered us a free cup of coffee too. When you place an order, they give you a number to put on your table and when it is ready they bring it over to you. Oh, my, it was so good especially the bacon onion cheddar bread. 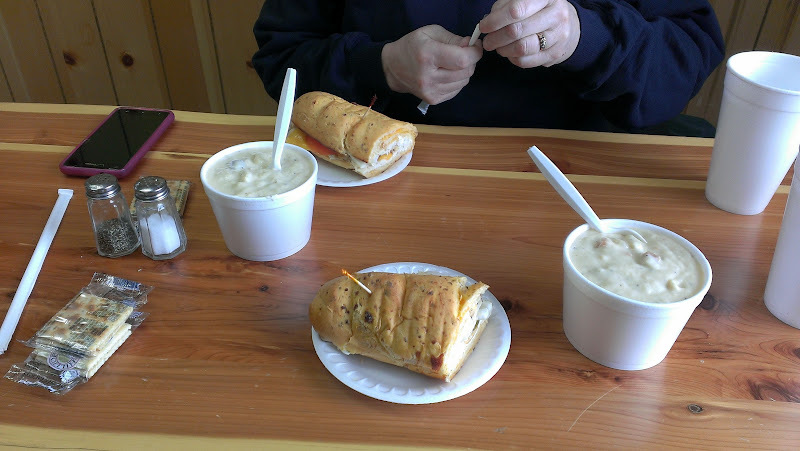 And the ham chowder was steaming hot, nice and thick and delicious. Very filling! While we were eating, I noticed a steady stream of people carrying boxes of donuts out of the store. A very popular place! Once our tummies were full, we went back up to the counter where there are display cases filled with donuts, apple fritters, cinnamon rolls and other goodies and a tray with samples, including their caramel cinnamon doughnuts. Just after one little bite, my sweet tooth died of sugar overload but boy were they good. Then we wandered around the store looking at the jars of veggies and fruits and other healthier options. So many goodies! I was amused by some of the names of the jams/jellies such as Traffic Jam and Hoppin’ F.R.O.G. Jam (Figs, Raspberry, Orange Peel and Ginger). Really hard to describe all that they had on their tables. At the time, I was glad I had just eaten, otherwise our credit card would have been seeing some action. Knowing that we probably wouldn’t eat any donuts until the next morning, we decided that once we checked out of Essenhaus we would come back and buy some on Thursday. Well, that was a mistake! After we had our usual sausage and gravy continental breakfast at the Essenhaus with their home made pastries, we decided that we really didn’t need more sweets. Wouldn’t you know that a few hours later we were wishing we had them to munch on! Oh, well, there’s always a next time. If you are ever in the area, Rise ‘n Roll is definitely worth a visit! You come across the most amazing places to eat. I’ll have to put this place on my bucket list because I like their philosophy == dessert first.